Audra Jennings: Systematic theology for kids? Theology is brought to life for young people in the new book The Ology (New Growth Press), penned by celebrated children’s author Marty Machowski, with stunning illustrations by Andy McGuire. The Ology is the first of its kind — a systematic theology book designed specifically for young people between the ages of 6 and 12. One might think the topic is too complicated for young minds, but Machowski disagrees. Q: For many adults, the thought of picking up a book on systematic theology can be overwhelming. 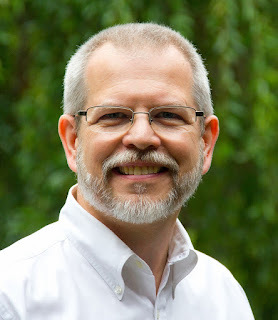 Why write a book of systematic theology for children? Systematic theology sounds deeper and more complicated than it really is. Theology is just the study of God and kids are learning about God all the time. Systematic is simply study in a logical, organized way. So in systematic theology we teach kids about God, one step at a time. We start out at the beginning with God, who created the world, and end with the promise that Jesus is returning again. Not only can kids benefit from learning about God in a logical, organized way, I find parents can also benefit from an easy-to-understand, step-by-step explanation of God and how he relates to all of us. Q: How were you able to make the more complex biblical topics some adults wrestle with accessible to children? Children love word pictures, stories and illustrations. The Ology is full of analogies and word pictures, and Andy McGuire did a great job providing fun illustrations. For example, the Bible tells us to put off our old self and to put on our new self, but that is a difficult concept to understand. To help explain it we compare the concept to putting on a new pair of shoes. There is only one way to enjoy walking in a brand new pair of shoes. You’ve got to take the old ones off and put the new ones on. There is no way new shoes can be worn over old ones. In the same way, we have to take off our old sinful way of living and put on our new life, living for Jesus. Q: You’ve said parents are teaching theology to their kids during everyday interactions. Can you share an example of what that looks like for you as you parent your children? Every parent has gone through a season where one of our children repeats the same sin over and over again and doesn’t seem to be able to stop. Too often we’ll say something like, “How many times do I have to tell you to . . . speak to your sister kindly or take your shoes off at the door?” Instead of getting frustrated with a child who doesn’t seem to be able to obey, we need to recognize his or her consistent pattern of disobedience is an opportunity to show him or her just how much he or she needs Jesus and the Holy Spirit to help. The truth is he or she can’t obey on his or her own. It is only when our children learn to trust in the Lord that they can say no to sin. Teaching them about their sinful heart and their need for Jesus is teaching them theology. 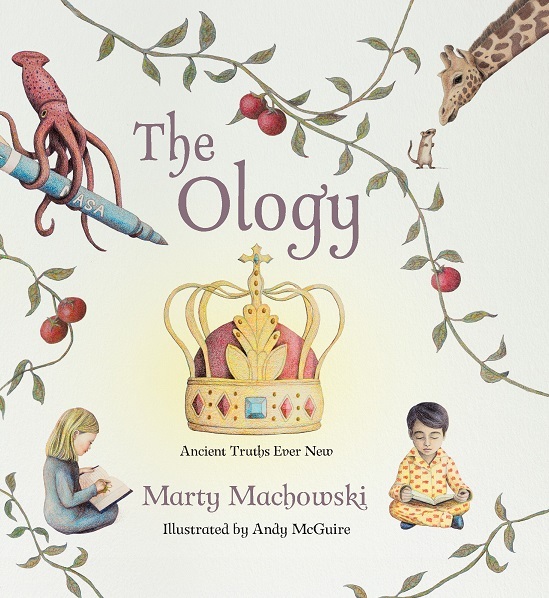 Q: Tell us about the story that introduces young readers to The Ology. I wanted to introduce the book in a creative way and help kids get excited about the importance of learning about God. I’m hoping the story draws the children in. We really have been handed a gift in the theology that has been passed down through the centuries. I really believe our culture is in danger of marginalizing theology and the study of God. Too many kids have given up reading for playing games on their personal electronics. My hope is to get kids excited about theology and help foster a love for the Word of God in their lives. Q: How did you manage to make The Ology connect just as well with a 4-year-old as with a 6th grader? I wanted The Ology to appeal to a broad audience. I set out to accomplish that goal by embedding layers of information in the book. On the surface you have fun pictures and easy-to-understand explanations for each theological concept. But if you look closely, you notice each illustration is sprinkled with Bible references. Those scriptures are the same verses I used as the foundation for what I say about a topic. There is a study guide in the back of the book for older children with questions that can only be answered by looking up those scriptures. So while it is a picture book of theology for the youngest children, it is also a systematic theology curriculum for older kids. Q: How is this book designed to be read with younger children? What elements can be added for teens? Q: The illustrations in the book by Andy McGuire are beautiful and unique; tell us about your collaboration as you chose which pictures would enhance different points of theology. I am so excited about the illustrations Andy put together. I put together a list of suggested illustrations when I first wrote the manuscript. Many of those ideas carried through and are a part of the book. But a lot of the illustration ideas came from Andy. His creative mind and colored pencil-over-watercolor technique brought our ideas to life. Q: You have written a number of books and curriculum teaching the Bible and theology to children. Why is this a particular passion for you? The Bible is clear: The gospel (the life, death and resurrection of Jesus for the forgiveness of our sins) is the power of God for the salvation of everyone who believes (Romans 1:16). That means the gospel is what transforms our own children’s lives and helps them believe. Parents want to see their children develop a love for God and live for him. That can’t happen without teaching them solid theology and giving them the Gospel message. That is why I keep that at the center of my books. Q: What makes The Ology unique from other books written for children? I think most adults believe systematic theology is too difficult for young children, so there are not many books available to teach these concepts to grade-school children. There are great books for teens, but I’m not aware of another illustrated systematic theology for grade-school kids. Q: You start The Ology with a beautiful dedication. Can you tell us who Carl Rausch was and how he influenced your faith? Carl is my wife’s grandfather who lived to be 104 years old. He was the family patriarch, and I got to meet him just before he died during our engagement. In those few moments at his bedside, Carl wanted to make sure we dedicated our marriage to Christ and that “we always made room for Jesus in our home.” That is what The Ology is about. I hope this book honors the mission and passion demonstrated by Carl Rausch’s life. It was through his prayers and sharing of the gospel with his children and grandchildren that all of them trusted in Jesus Christ for their salvation. Q: How did you organize the topics addressed in the book, and why did you put the Bible section last? I used the story of the Bible as the framework for The Ology. The Bible starts with God and his work in creation, and that is a logical place to begin for kids. I wanted to put scripture last to emphasize it over what I wrote and to be able to transition to the Bible study found after the book. It is my hope that The Ology fosters a love for God’s Word and a desire in children to go beyond what I’ve written. Q: What have you heard from adults about what they’ve gleaned from The Ology while reading it with their kids? Adults who’ve gone through The Ology have frequently commented on how helpful it is to read about the truths of God in a simple-to-understand format. They tell me they are learning right alongside their children. Q: What is your favorite part of The Ology? My favorite section is “The Ology of the End Times,” where I talk about Jesus coming again. I love the fact that the Bible tells us the end of the story — the part that is yet to come. Jesus wins in the end and puts an end to sin and death. While trusting in Jesus to have your sins forgiven, our real hope and longing is for his return, when heaven will be right here on earth. Jesus will recreate the earth, and we will enjoy him right here with majestic mountains, beautiful forests and gardens. We’ll live free of sickness and disease, and we’ll never tire of singing his praises. Q: How do you hope The Ology impacts children’s lives? I hope children develop a clear understanding of the basic truths scripture presents and that those truths spur on a love for God’s Word and a desire to study scripture. The Ology only scratches the surface of a gold mine that runs miles deep. God’s Word is an inexhaustible deposit of truth. I’m just opening a door to an eternity-long study of God.